I'm watching Bremner, Bird & Fortune on Channel 4, as I type and I see that the latter pair are running through a sketch, which puts David Milliband in to replace Tony Blair, because Milliband has the "right killer instinct", having already had 194,000 Bernard Mathews turkeys done away with! Traffic across the website has jumped quite remarkably over the last three days, with double the number of new visitors. So "Hello", "Welcome" and I assume that you have found this weblog via the Thanet Gazette? I'm really very interested in what our readers think the direction of local government in Thanet should be after May 3rd? What's been done well, what's been a disaster - other than some of the more obvious favourites - and how and where can things be done better? The good thing is that local politicians of all sides dip in and contribute regularly. Some under their real names and some, I know, anonymously, so whether you like my own politics or not, you have a better chance of raising an issue and having it noticed here, than many other places. So if there's an issue that should be "an issue" as May 3rd approaches, raise it for discussion here and if it's salient, it may be given its own thread. 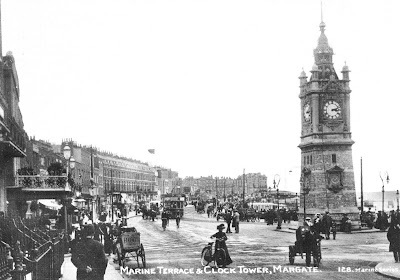 Finally and on another subject entirely, for those of you who didn't know it was there, here's a slide show collection of old photos of Thanet that I have collated for readers to enjoy. Thank you for the slide show. interesting to see flag above Marine Terrace showing a very stiff N/NE wind blowing in, as it has done predominantly for past few weeks! The main issue in local (and National) politics seems to me to be public accountability: Consultations carried out with no intention of taking the results into consideration when the decisions come to be made, petitions that are totally ignored, unelected Council Executives receiving obscenely inflated salaries, attempts to break local bylaws with illegal development. In Ramsgate over the a long period of time and through different administrations we have suffered very badly from the loss of our leisure facilities and seafront parking, running a small business in a leisure town with essentially no leisure facilities and over the last 20 years while they have slowly gone is frankly very difficult. The main leisure site behind the sands has been empty for an unreasonable amount of time while the developer and the council have tried to find a way of fitting an 18 meter high building into the 14 meter gap between the high tide line and the cliff top. Desperate attempts by the architects to solve what is obviously an impossible problem even involved plans of the building showing people with their heads embedded in the ceiling. What I think we need here urgently is temporary solution while the situation is resolved to give the town some sort of leisure facilities this summer, tarmacing over the site so it could be used for parking and a fun fair and less unsightly temporary railings on the cliff top wouldn’t be expensive. What I find though so depressing is that when I raise these issues the conservative Councillors won’t reply to me, and the Labour councillors try to score political points out of the disaster. Slowly the inference has been drawn by the population of Ramsgate that the furtherance of political careers has taken a precedence over an interest in the town, when this reached a point that local residents voted to pay for an extra tier of local government that was essentially canvassed on the basis that it would protect them from their district council, I realised that some serious changes have to be made. The council runs two offices in the town centre, where one would expect to see plans of major local projects openly displayed for the residents consultation, what has happened instead is that local people see their district councils decisions as something secretive in which they have no part in, except to complain about. Come the elections we are faced with the dilemma of Conservatives who won’t answer quite reasonable questions about important issues that affect the town and Labour who only seem to want to lay blame. There are of course the independents, however it is most important that we have a number of members of the cabinet residing in the town proportionate to its size. So an issue for the council is to find better way of communicating with the local population, especially where difficult compromises have resulted unpopular decisions that need explaining properly to the people they affect. Michael Child brings up a very good point with the political aspect of local politics. At this level party politics should be rather less significant than it is in Westminster for example, where they have a full blown whip system with all the bells and whistles. Down heres theres still a strong sense of party politics going on, which hardly encourages public participation in the form of voting. Maybe the reason for this style of politics is down to the fact that the local political parties are generally made up of older people. Im talking averaging 50-60. I dont see many young people interested in politics down here. In fact I suspect Im going to be the youngest candidate by a country mile in 3 weeks time. I hope that the people of Thanet will buck the trend of only one in three bothering to vote this election and vote in a good number of Independents. Only this will ensure true accountability for local people and local issues,free of party political interference.An Independent Councillor has no master except the people who vote him/her in,it will also ensure a proper balance to local decisions that hopefully will benifit the people of Thanet first and foremost.